This is a remarkable astonishing foresight: from the peak of Hebrew power, affluence and influence in Egypt, Joseph is able to anticipate the inevitable dissemination of his life’s work and the departure of his family and community out of the land that has been so good to him. Indeed, this prediction materializes centuries later, when Moses and the People of Israel depart from Egypt, carrying the bones of Joseph with them. Hence, this is a story of the rise and decline of Hebrew life in the greatest nation of ancient history. The ascent of Joseph is a Jewish classic of one person who succeeds and then supports his family through a combination of wisdom and hard work, of resilience in the face of adversity, of ability to embrace key tenets of the dominant culture, while preserving a unique identity, of ‘double loyalty’ to Pharaoh and nation, as well as to his Hebrew family, and of rendering exceptional service to the host society. That ascent leads to expansion of the community and to great prosperity for the entire tribe. Generations later, some factions of Egyptian society turned against the Hebrews and tried to marginalize them. Notwithstanding Joseph’s crucial contribution to Egypt, Jacob’s descendants become the subject of sanctions, designed to limit their numbers and curb their influence. They will then become a matter of imperial interest, by Pharaoh himself and his top advisors, who are dealing with ‘the Jewish file.’ Soon to follow will be the exodus. Thus, the story of Hebrews in Egypt can be read as a metaphor for the inevitable cycle of rise and decline of great Jewish Diasporas, all of which began with hard-earned success by a tiny minority, which led to growth in numbers and prosperity. Then comes far-reaching influence in politics and government that is turned into remarkable power and authority, which then bring their own perils of animosity and envy that later convert into oppressing legislation and harsh measures. At that point, the treatment of the Jews becomes a ‘societal obsession’ involving all echelons. This is not just the stories of the Hebrews in Egypt, as we read in Torah, but also of the Jews in Persia, as is described in Megilat Esther, and, albeit with significant variations, also of Jewish communities in places such as Alexandria, Poland, Spain, Germany and the Soviet Union. These worsening conditions then push Jews out to return to their land or to explore other Diasporas, with the hope that their predicament could, at last, be avoided. Yet, history ends up repeating itself. Many argue for the exceptionalism of Jewish life in the USA. They hold that Judaism is so intertwined with American values, and that the moral foundations of this great nation, which emanate from humanism, liberalism, democracy and free market, offer unprecedented protection to Jews in America. 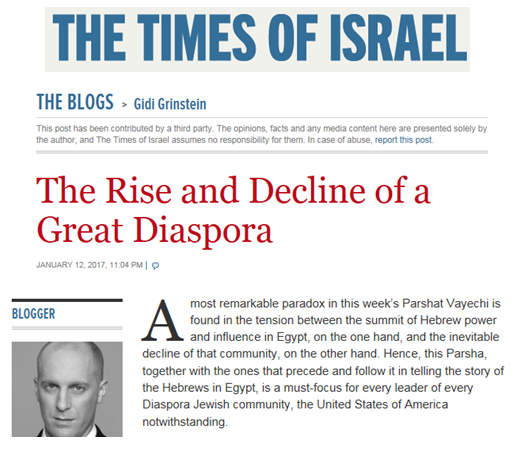 Therefore, they argue, American Jewry cannot and will not be subject to those historical dynamics of rise and decline of Jewish Diasporas. Well, this week’s Parsha is a challenge to this view. First, American Jewry is a young Diaspora. Joseph rose to prominence within a lifetime, but the Exodus happened some three hundred years later, and other great Jewries took centuries to rise and decline. In other words, it is too soon to tell whether American Jewry has been able to establish a different and more resilient model. Second, American Jews have checked all the boxes of the ascendance to power: wisdom and hard work; assimilating yet preserving of otherness; figuring out the rules and thriving within them; and making a massive contribution to society. In fact, their influence on the USA may be unprecedented in Jewish history, with Chanukah parties and Seders at the White House being the celebratory manifestation of this phenomenal achievement. The question then becomes to what extent American Jewry is also following the path of decline, which, to date, has been inevitable. In this case, the situation is even more nascent. The exceptional influence of American Jews and their disproportional acquisition of positions of power and authority in all branches of government, both federal and local, and in all areas of society, have been in exponential growth for the past three decades. So, at the moment, everything seems to be moving in the right direction. Nonetheless, dark clouds may be gathering. A particularly worrying one is the gravitation of the view of Israel from being a bi-partisan matter, uniting Americans, into a wedge issue between powerful political factions within American society and politics. Recently it seems that for some the treatment of Israel is becoming a defining political issue, a newly born sibling to the political litmus test of pro-life-pro-choice. Suffice to say that our history — from Persia to France and Germany — warns us that such a condition is perilous. Parshat Vayechi foretells a Jewish history of a permanent, generations-long motion of rise and decline of its leading communities. But it also teaches that leaders, modern-day Josephs, can do a lot to wisely build and manage power or to slow and reverse the process of decline. In current terms, it highlights the importance of continuing to make a significant and distinct Jewish contribution to American society, and of actively seeking and building strategic partnerships and alliances with key non-Jewish constituencies such as the Latino or African-American groups. It also calls for bolstering bipartisan organizations that work with both parties and all factions of society to de-polarize the issue of Israel, and warns against all those who are turning it into a defining wedge issue of American politics. But there is an even bigger take-away, perhaps more comforting, from this Parsha: the Jewish People is endowed with the ability to pragmatically gravitate from places of hardship and oppression to places that grant Jews safety, freedom and prosperity. We came to Egypt and we left Egypt for a better future. The same can be said about dozens of other Diasporas. Therefore, should American Jewry eventually decline, the Jewish People will go back to the Land of Israel or build another great Diaspora, and that mobility is one of the great secrets of Jewish resilience, recurring prosperity and permanent leadership.